Tailored to suit your unique hosting needs. Whether you’re just starting from scratch or transferring a complex system, creating your new account is a breeze. You'll then find easy to use tools, a super fast network and company dedicated to your success. Our accounts scale with your business, and unlimited means never having to worry about outgrowing your plan's features. Set up as many email addresses, subdomains and databases as you desire. Unleash the power of our hardware, hosting your website with native SSDs, a 1 Gbps network, and super fast processing - all resting on top of a secure environment that backs up your your data every 12 hours. Our expert support staff is only a click away anytime help is needed. Our hosting support area features ticket based Helpdesk, a Knowledgebase with easy to follow information, and a wide-range of other support options. Kids, meet the candy store. We utilize premium SolidFire SSD SAN drives (no spinning disks! ), which boast the fastest performance in the industry. Blazingly fast PHP 7 offers up to 3x the speed of previous versions, and comes standard with all of our accounts. Optimized to run your favorite Content Management System with ease. Craft, ExpressionEngine, WordPress? Yep! The very latest Intel Xeon ® processors, lightening fast DDR3-1600 ECC RAM, and 100k burst IOPS. Need a specific flavor of PHP 5.x? A specific PHP extension installed? You can easily customize your account. Our automated, incremental R1Soft backups run twice daily to ensure that your data will always be safe and accounted for. Automatic WordPress installs, multiple PHP versions, CloudLinux, MySQL 5.6, CURL, ImageMagick, and much, much more! Our servers boast 99.9% uptime, 1k guaranteed IOPS. All of this on a 1Gbps Public Network and 1Gbps Private Network. Developers - easily deploy your code securely, as GIT comes pre-installed specifically for nerds like you! Like a boss, that’s how. cPanel is widely recognized as the best hosting control panel available, and makes website and domain tasks a breeze. All of our accounts use an encrypted connection so that you can securely connect to your cPanel, files and/or email. Easily manage anything: email accounts, databases, apps, security & SFTP via cPanel’s graphical user interface. 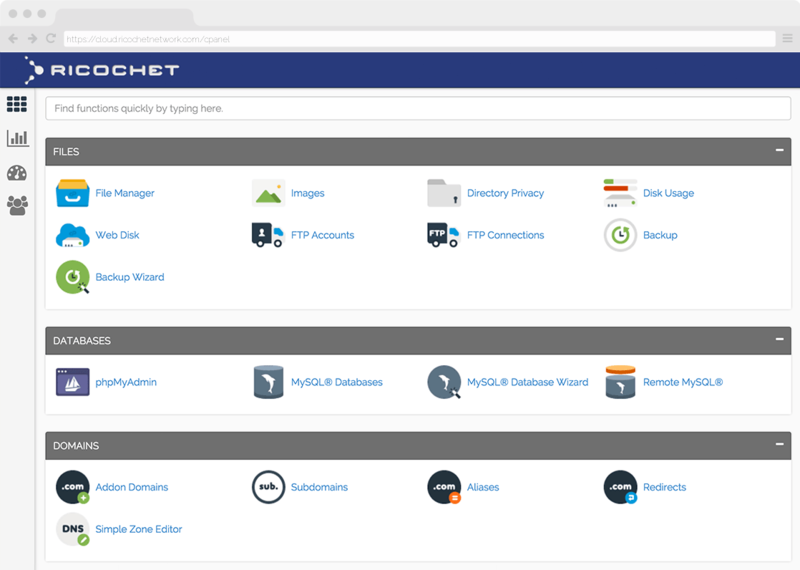 Check out the cPanel Demo which let's you see what the control panel interface looks like in your browser.